Two nights after the Knicks lost the first Battle of the Borough’s to the Nets they are back in action on the road against the Milwaukee Bucks. The Knicks are in need of a win and have dropped three of the last four games since jumping out to a 6-0 start. 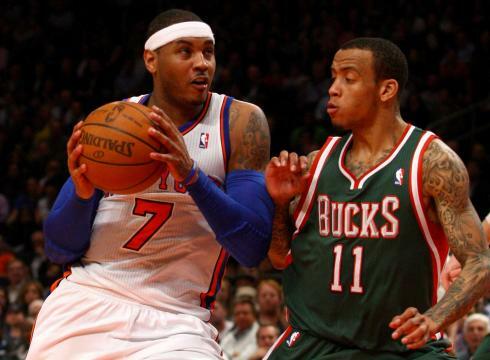 After losing their third straight road contest to the Nets at the Barclays, the Knicks travel to Milwaukee. Jason Kidd will miss his second straight game and did not travel with the team to Milwaukee because of back spasms. They face a Bucks team that sits atop the Central Division in the Eastern Conference at 7-5 and can really score the ball, something teams have been doing with ease against the Knicks the past several games. The Knicks did hold the Nets to 96 points in an overtime game on Monday night, but gave up 100+ points the three games prior. A bright spot that came out of the Nets game was the reemergence of Tyson Chandler, who poured in 28 points and grabbed ten rebounds, demonstrating some of the energy and intensity we become used to seeing with him. Bench Scoring: The Bucks come into the game second in the league in bench scoring, getting 42 points from their reserves this season. On the flip side, the Knicks are only allowing 32 points per game from the opposition’s bench. In Milwaukee’s comeback victory over the Bulls the other night, their bench outscored the Bulls 56-10, clearly turning out to be the difference in the contest. The Knicks will have their hands full with the two starting guards of the Bucks, so it will be crucial for them to win the battle of the second units tonight. J.R Smith could never get going offensively the other night against the Nets, and the Knicks offense struggled because of it. Chandler and Anthony scored a combined 63 points against the Nets and the Knicks scored 89 as a team; they need J.R. to add some scoring off the bench. Play of Raymond Felton: We all know how poor Felton shot the ball the other night. He was 3 of 17 from the field and couldn’t find his jumper all night. He also seemed to be a little hesitant on some pick and rolls with Chandler, caught in between whether he wanted to drop in an eight-foot floater or throw Chandler a lob. He and Tyson connected on a few real pretty pick and rolls that led to easy Chandler dunks, but overall Felton played easily his worst game as a Knick. With Kidd out for the second straight game, the play of Felton will again be under a microscope, and they will without a doubt need a better shooting performance from him. I’d also like to see him and Tyson run that high pick and roll more often, and Felton improving on the decision-making. His defense will also be put to the test against the two electrifying guards, especially since Kidd will miss his second straight game and Ronnie Brewer ailing with a dislocated finger. 3-Point Shooting: The Knicks come into tonight averaging just fewer than 12 threes per game to lead the NBA. It has been a major part of their offense so far this season. They were able to knock down only six against the Nets on Monday night, and it is no coincidence they lost the game. Novak looked like he regained his stroke in the game prior against the Pistons, but barely showed up against the Nets as he attempted only three shots. Steve Novak is a key part of this offense when he is able to spread the floor, but he is obsolete on both ends of the floor when he isn’t hitting the three ball. I look for him to hit some big three’s tonight to help the second unit along with J.R. For the Bucks, they shoot under 30% as a team from behind the arc, so the Knicks will need to keep them around that number tonight. The Bucks are also a pretty good rebounding team with Samuel Dalambert and Ersan Ilyasova who both attack the offensive glass. While the Knicks outrebounded the Nets in the fourth quarter on Monday night, they were outrebounded for the first three quarters, and got abused on the glass by Reggie Evans who grabbed 14 boards in 17 minutes. Rebounding continues to be an issue for the Knicks, so I would like to see Kurt Thomas and Marcus Camby show up and help on the rebounds.